My husband and I love to make our own versions of everyday foods, whenever we can. Jams, pickles, lemonade, waffles, pancakes, breads...these are just some of our favorite staples. Having about 3 slices of bread in our kitchen, I knew the time had come again to make some more. The thing is...bread takes time...and well...time is hard to find. Sorry for that strange tangent. Anywho...bread. So I also spent the afternoon making bread. 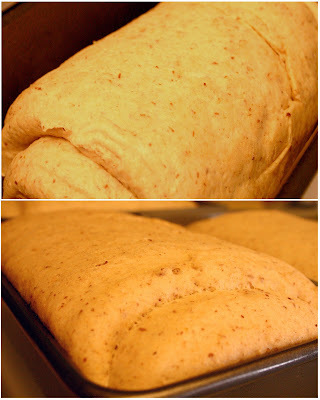 Let me just say...as I type this wonderful (yeah it's turning out to be a wonderful one alright) blog...the smell of fresh baked bread is just absolutely mouth watering. There's nothing quite like it. If you've never experienced it for yourself, PLEASE PLEASE make this recipe, stat! Here is our Whole Wheat Bread Recipe! 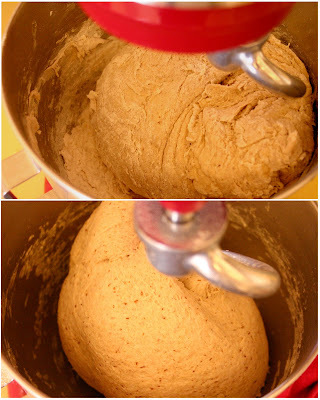 In a large bowl (or the bowl of your electric mixer), mix warm water, yeast, and 1/3 cup honey (with the dough hook if using mixer). Let sit about 5-10 minutes until bubbles have formed on the surface, it is frothy, and you can definitely smell yeast. If this does not happen after 10 minutes you may have old or "dead" yeast. Start again with freshly bought yeast. Add 5 cups whole wheat flour and stir to combine. Let set for 30 minutes, or until big, bubbly and doubled in size. You can see here it really does double! Mix in 3 tablespoons melted coconut oil or olive oil, ground flax seed, and salt. 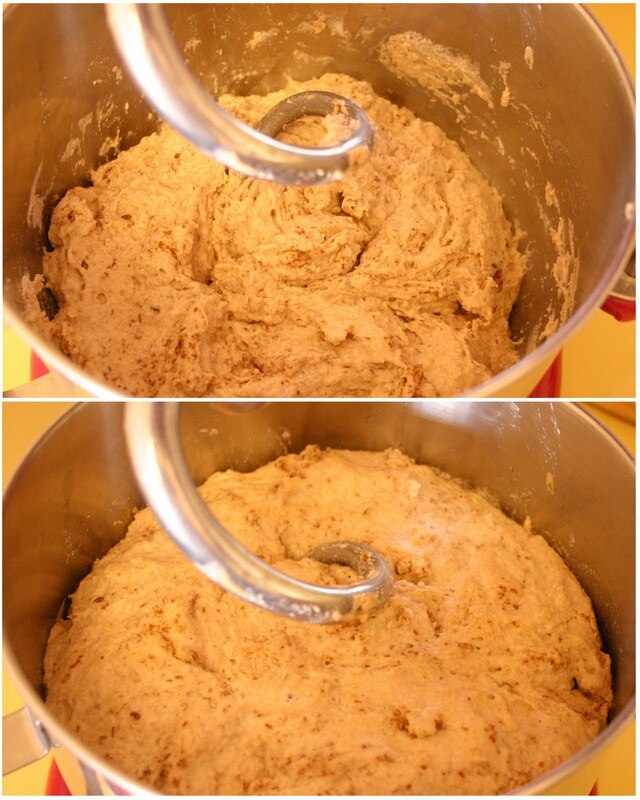 Stir in 2 cups all purpose flour and mix with dough hook gently until all the flour is combined.This is your variable. You may need less four, or more depending on where you live and the weather at the time. I suggest starting at 1/2 cup and adding an additional 1/2 cup until your dough has become a ball, and is not sticking to the sides while it is mixing. If you decide to knead by hand, flour surface and knead in 1/2 cup increments of all purpose flour until you've created a ball and the dough is not sticking to the counter. This is what you want your dough to look like: a nice ball, and not sticking to the sides at all. Bake at 350*F for 25 to 30 minutes. Make sure to not over bake. Lightly brush the tops of loaves with 2 tablespoons melted butter or coconut oil if you'd like when done to prevent crust from getting hard. Cool completely. Enjoy!! Whaaaaaa!!!????? Yes please. I'd like to eat some right now.